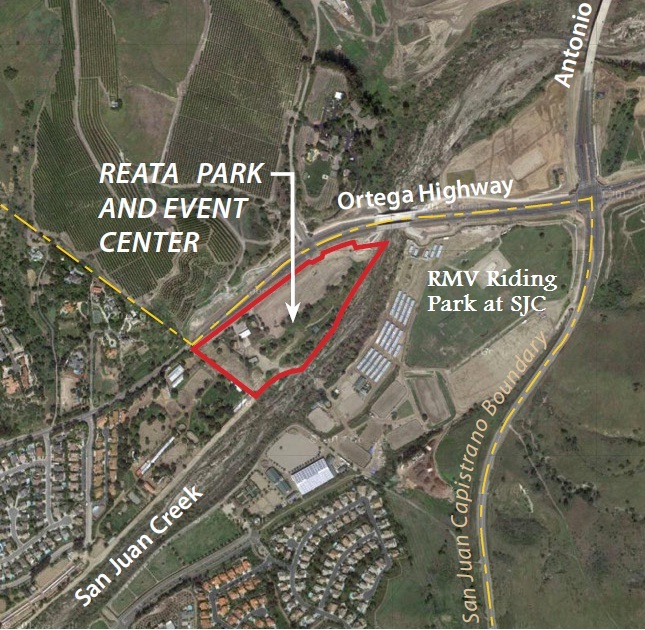 San Juan Capistrano has recently announced the creation of the Reata Park and Event Center, a proposed city park located at the eastern edge of San Juan Capistrano on Ortega Highway near the Rancho Mission Viejo border. The current plan for the area contemplates a passive community park on about 12 acres of the 18.4 acre site, including a welcome center (located in an historic ranch house), event area for weddings and private parties, staging area for access to the nearby hiking, biking and equestrian trails, restrooms and parking. The park site was previously part of Rancho Mission Viejo and was designated for housing in the original Ranch Plan. When the City of San Juan Capistrano purchased the 70 acre parcel now known as the Rancho Mission Viejo Riding Park at San Juan Capistrano, the Reata park site was part of the purchase. The entire 132 acre area purchased by the City, including Reata and the Riding Park, was annexed by San Juan Capistrano in 2009. Currently the site is more of an eyesore than anything else. It contains a small orange grove fronting Ortega, a gravel entry road and a handful of dilapidated structures left from the days when it was used by Rancho Mission Viejo Company. The western edge of the site is also subject to a 200 foot wide Edison easement, through which the electrical overhead transmission lines run. Two Edison towers sit within this easement which is also subject to a land lease. 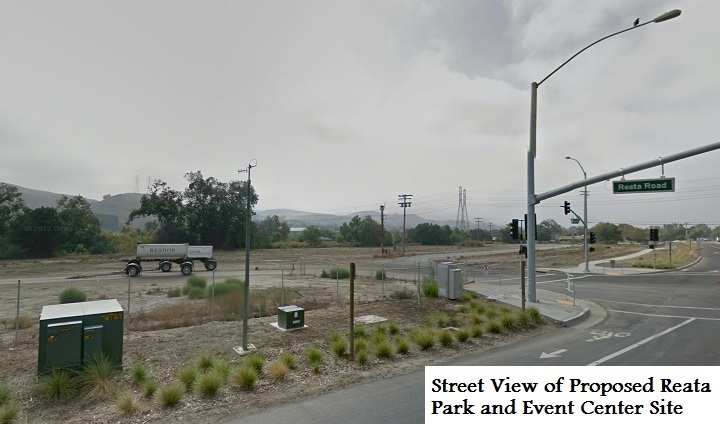 Caltrans also possesses an easement through the property. When completed, however, the Reata Park and Event Center is going to be a beautiful addition to San Juan Capistrano’s portfolio of protected open spaces. The completed park will have parking for cars and horse trailers, a two acre welcome center with historical exhibits, heritage gardens and native landscaping, a horse corral with twelve individual pens, a three acre orange orchard, picnic and event areas with shade structures, BBQ grills and tables and connectors to regional hiking, biking and equestrian trails. The existing San Juan Creek crossing will be maintained and the facility will include trash and restroom facilities. When the land lease encumbering the Edison easement expires, that portion of the property will be converted to additional parking with a second entrance from Ortega Highway. 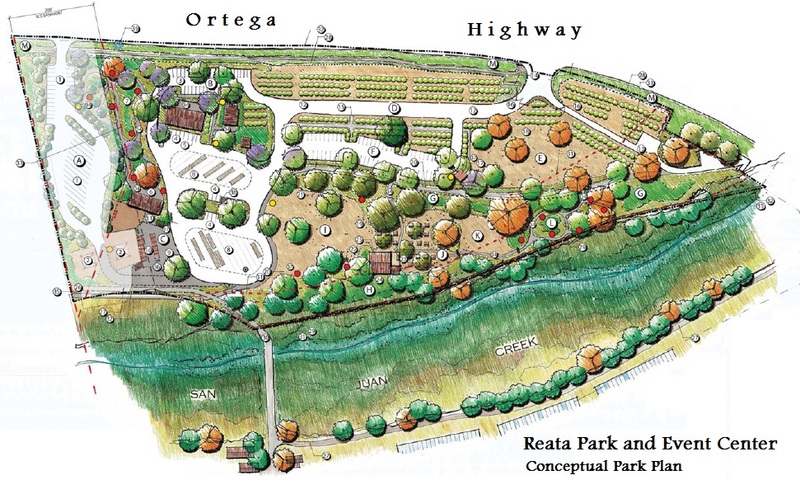 The rendering below (excerpted from the Park’s environmental impact report) shows the layout of the conceptual park plan for Reata.